The last time Bradford City played at the Valley, home of Charlton Athletic, Stuart McCall received the only red card of his entire career and Chris Hutchings was sacked as manager. This was November 2000, the Premier League days, with a 2-0 loss to Charlton making it just one Bantams victory in the first 12 games. Hutchings – who had only been promoted to manager during the summer – paid the price. Charlton were the third newly promoted club to defeat City 2-0 over that sequence, and panic set in at Valley Parade. It is an understatement to say that a lot has changed over the last 16+ years. The Bantams bowed out of the Premier League that season, while Charlton thrived in the top flight. They stayed amongst the elite for seven seasons, before getting relegated in 2007 – the same year the declining Bantams fell into the bottom division. For both clubs, the post-Premier League years weren’t kind. This year marks a decade since Charlton’s last Premier League match. Like City, they quickly fell through the Championship and into League One (Phil Parkinson in charge when they went down in 2009), although at that point they at least bounced back to return to the second tier in 2012. That was their new ceiling for now, as ownership problems provided the backdrop to last season’s pitiful relegation from the Championship. This year, they are on course for mid-table mediocrity and the mood around the club remains dark. But at the other Valley – the Parade variety – there is proof that football goes in cycles, and that the good times eventually return. We have undoubtedly suffered more than Charlton after our Premier League adventure, tasting the lowest of low points scrapping to avoid relegation from the Football League. But since 2012 it has been a blissful, exhilarating ride upwards. And as City go to the Valley on Tuesday, they are nine games away – or possibly 12 matches, if they finish in the play offs – from a return to the Championship that we vacated 13 years ago. Whilst the owners Edin Rahic and Stefan Rupp talk boldly of taking the Bantams back to the Premier League, for long-time City supporters at least the second tier feels like our natural home and where we should aspire to be. Either way, there is so much riding on these final nine games. The image on the right lists Bradford City’s remaining fixtures. There are four left at home and five on the road. The games at Valley Parade look relatively kind, with Swindon (on Saturday) in the bottom four, whilst final home opponents Wimbledon have nothing to play for. Walsall (on 1 April) and Oxford (14 April, Good Friday) both still harbour play off hopes, albeit they are some distance behind and could be too far out of contention by the time they travel to West Yorkshire. Certainly these four home games offer nothing to fear, and raise the prospect of City successfully staying unbeaten at Valley Parade for the full season. The away fixtures are headlined by trips to Scunthorpe (26 March) and Sheffield United (17 April, Easter Monday). Scunthorpe United are struggling badly for form at the moment. The Blades currently stand nine points clear of third place Bolton, but if they can increase that advantage during the run-in they will seal promotion before they play City. That said, they may still have the major incentive of the league title to play for on Easter Monday. The other three away games aren’t especially daunting. Charlton already have nothing to play for, save getting a couple more wins to guarantee they don’t get sucked into a relegation battle. Bury (who City play on 8 April) are just above the bottom four right now, and recent form is decent. Rochdale, on 30 April, are unlikely to go into that final day clash against the Bantams playing for anything beyond pride. Accepted wisdom is that, during an end of season run-in, it is better to play midtable teams than those fighting for their lives to either get promoted or avoid the drop. It doesn’t always work like that, as teams whose season is effectively over can often play in a more relaxed, carefree manner that sees them pick up good end-of-season results. Nevertheless if you could handpick City’s final nine games, you wouldn’t move a million miles away from the ones they are set to play. All of which opens up the question – can City still make the top two? Since Christmas it has felt like that ambition was beyond us, as the teams near the top pulled clear. But all with the exception of Fleetwood have experienced bad patches of form, and the current two-point gap to second looks very manageable to bridge. Firstly, Sheffield United’s promotion is not really in doubt, judging by their run-in. Only visits from Millwall and ourselves will offer any heightened Blades anxiety. Trips to struggling Swindon, Oldham and Port Vale won’t be easy, but they’re top of the league for a reason and should finish the job. Fleetwood – beaten for the first time in 18 on Saturday – will still be buoyant about their run in, with home games against Wimbledon, Swindon, Gillingham and Port Vale more than winnable – only the visit of Millwall to Highbury looks tricky. On the road most of Fleetwood’s opponents have something to play for, but they have the fourth best away record in the league. Even after losing to Bolton on Saturday, there is a real chance Fleetwood are going to achieve the most surprising League One promotion since…Burton a year ago. As for Scunthorpe and Bolton, Saturday 8 April looks a crucial day, when the two teams meet at Glanford Park. With Rochdale and the Bantams also due to travel to Lincolnshire before then, Scunthorpe’s next three home games look tough; before their home season ends with visits from the current bottom two sides – Chesterfield and Coventry. If Scunthorpe go into their final three games still in with a shout of the top two (which must be in doubt on current form) they will fancy their chances. Bolton’s home games look relatively easy, but on the road they have a tricky run-in. Aside from mid-table Gillingham on Saturday, they go to Oxford, Shrewsbury, Chesterfield, Southend, Scunthorpe, Oldham and Port Vale. All of those could be habouring either promotion or avoiding relegation aspirations – and Bolton’s away record is very average this season. The table looks good for the Trotters at present, especially as they have at least one game in hand on every other side in the top five. Returning to the question of whether City could steal a march for second: it is possible, but Bolton now look to be in the driving seat. It also requires an unlikely Fleetwood collapse in games they’d be expected to win. That City have moved above Scunthorpe over the weekend is significant, and means that the Bantams are now the third most likely team to claim the second automatic promotion place. But they’re still more of a dark horse than a favourite. The table below shows the remaining fixtures for each team with strong or linger play off hopes, again with key promotion six-pointers in bold. A word on Millwall first. Like Bradford City two years ago, they have reached the FA Cup quarter finals and enjoyed the national spotlight. It has also left them with league games in hand on pretty much everyone else during the run in. But as we saw with the Bantams two years ago, an end of season fixture pile up can cause problems. Millwall face quite a few midweek games in the run-in, played at times when their promotion rivals are resting up. Neil Harris will hope to have greater strength in depth than Phil Parkinson had in 2014/15, as City tripped up going through the backlog of games and missed out on the play offs. What’s more Millwall still have some really tough fixtures, with trips to Rochdale, Sheffield United, Fleetwood and Bristol Rovers, plus home games against Scunthorpe and Oxford. Bradford City are the only top five side they don’t face over their final 11 games. They also play every play off contender bar Walsall and Peterborough. It is not an easy run in. If Millwall do win their games in hand, it will be almost impossible for anyone to overtake them. Southend – who have done well to get into promotion contention but dipped recently – have the best hope. They have some straightforward-looking away games, although they face a number of strugglers who are scrapping for their lives. Their fate might be sealed during home matches against Walsall and manager Phil Brown’s former club Bolton. The rest of the teams are relying on either City, Scunthorpe or Millwall collapsing – and producing extraordinary end of season results themselves. With four of their remaining nine games against promotion rivals, Walsall face some high pressure matches. If they can get a good points haul from encounters with Fleetwood, Southend, City and Oxford between now and 8 April, they will go into the Easter weekend with four relatively easy fixtures left. Don’t write them off just yet. Everyone mentally dismissed Bristol Rovers’ hopes after they lost Matty Taylor in January, but they are still in the mix and have a favourable run-in. Their last game of the season, at home to Millwall, could be explosive if both teams are still scrapping for a play off spot. Whether Oxford can keep pace with the rest is doubtful, but make no mistake they will have a massive say in the shake up. They still have to play Fleetwood, Scunthorpe, Bolton, City and Millwall before the season is over. All but one of their other fixtures are against teams fighting the drop. Oxford’s results are going to be really interesting for many reasons. That leaves Rochdale, who have recently slipped out of contention. But Keith Hill reportedly doesn’t want to get promoted anyway, so presumably they’re happy about it. Peterborough are fading fast. City currently have an eight-point cushion over 7th-placed Southend. The fact so many teams immediately below the dotted line still have to play each other offers encouragement that not enough chasing-pack sides will go on a run to threaten a place in the play offs. As things stand, it would take an unlikely set of results to prevent City finishing in the top six. 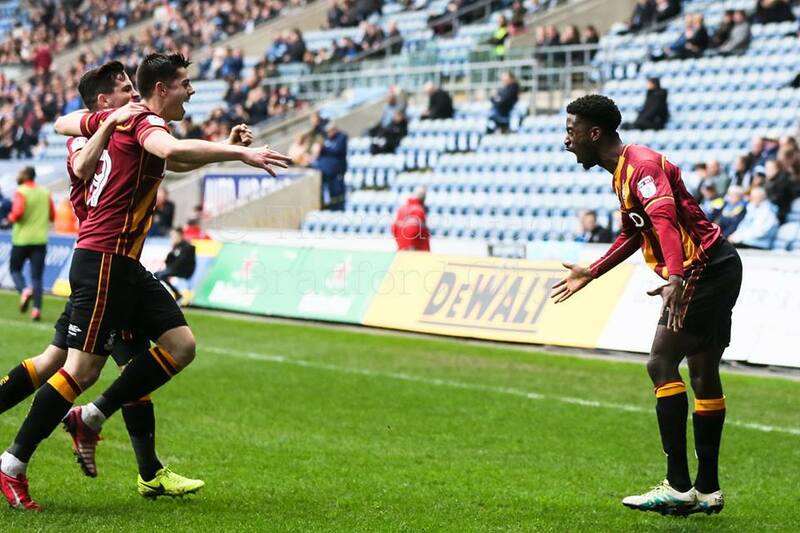 No one at Valley Parade should risk complacency, but three (or four) wins from the last nine games might be enough. Beyond that, seven or eight wins from nine would give them a real chance of the top two. It’s going to be an exciting run-in – and this is what we football fans live for. At this stage of the season, we’re all checking our phones during games for latest scores elsewhere. And away from the matches, we’re spending time mentally totting up other teams’ points totals and studying the league table intently. City are in a great position, as they have been all season. Whether they can make the top two is still debatable, but finishing off the job of sealing a play off spot is firmly within their grasp. Even though the Bantams have sat in the top six all season, it will still be an impressive achievement to finish in the play offs. A bumpy ride of twists and turns lies ahead. It won’t be dull, that’s for sure. Great analysis Jason, makes for an interesting read. Could you elaborate on the Keith Hill comment please? Has he really said that? I cannot find an online piece about it, but on Channel 5 a few weeks back they said Keith Hill didn’t want Rochdale to go up. I think because of the gulf in finances between the 2 leagues. Another fascinating article Jason. I remember going to The Valley in November 2000. If memory serves me correctly, we were 2-0 down fairly early on in the game and Atherton and Nolan didn’t play particularly well. As for the remainder of this season there will be plenty of results which don’t end up as you think they should. I am now starting to think that we will play Bolton Wanderers in the play offs at some stage! A few weeks ago I openly aired my views that I wanted City to have sealed a play off spot before the last game, which may see City and Rochdale scrapping for the final play off place. That scenario is looking more unlikely with each passing fixture. Yet as the final fixture against Rochdale appears to lose some significance, with so many games to go it could yet be relevant. At this stage no one can claim to know what the league standings will be on the final day, at 3.00 PM. Imagine – if future results fall a certain way. City may well need a victory in a bid for second place, whilst Rochdale too need a victory to seal the final play off spot. It’s far from impossible, and should that be the case, then expect to see a game not seen since City beat Wolverhampton all those years back. If the rewards at 5.00 PM had similar feelings about it, it would make the nail biting trauma worth while. Still, a long way to go before I start to get carried away………. Excellent stuff Jason. It is strange that this fixture, and the Coventry win from Saturday, involve teams coping with the fallout from the Premier League. I’m just doing baby steps at the moment, striking off the points required to secure the play off berth (75 points) though we are doing better than last year by 4 points! Ironically, looking at last year, we’d just lost away to Wigan with… drum roll… Vuckic scoring the only goal. Once we are firmly in the play offs then I’ll strike off the points required for automatic places! 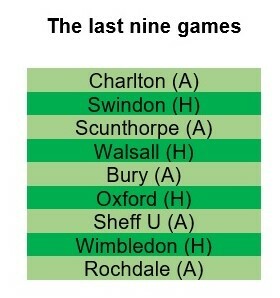 However I’m quietly confident that we will fare better in the play offs than last year. I don’t think this side can lose a two legged affair after 45 minutes! My only concern is the dark horse candidate. Last year Scunthorpe, who were on 52 points after 37 games, managed to nearly secure Barnsley’s spot by picking up 22 points from 27! Looking at the list of candidates, behind Millwall, I’d have to say Oxford might be this year’s dark horse. They have all the ingredients, productive January getting McAleny & Martinez in, and have a good record against us. Either way, still exciting times! Despite the defeat to Bolton at weekend, I still think Fleetwood have the momentum to grab the second automatic spot. If that’s the case then ideally we’d need to play Scunny in the play-offs. They’re short on confidence at the moment so its debatable whether they’ll even be in the play-off places in a few weeks time.